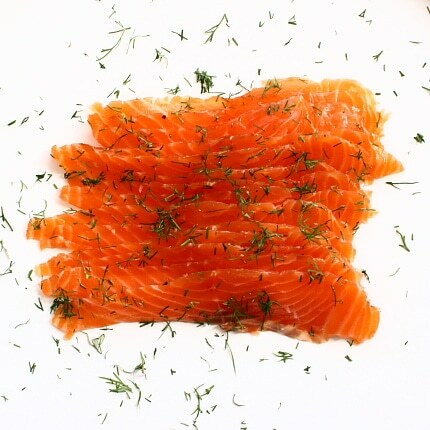 Gravad lax is very easy to make. It’s embarrassingly simple, but the results are astounding. The principle is very basic. You cure a piece of fish in sugar and salt, using the process to introduce other flavours into the fish, in this case, dill and pepper. One of my biggest problems with gravad lax is getting hold of enough fresh dill to flavour the fish. The pots of living herbs on sale at the supermarket are next to useless because they’ve been forced too quickly and therefore taste of nothing. A decent supply of properly grown, fresh dill is an absolute essential. I managed to strike a bargain on Twitter with a potential dill supplier – some dill in exchange for some of the resulting gravad lax. In retrospect, collecting a bunch of green foliage from one of the other parent’s in the school playground could have looked like a particularly inappropriate drug deal, but we got away with it without being busted. As the fish cures, it will shed a lot of water, which needs somewhere to go. There are a couple of schools of thought on this – to drain or not to drain. If you don’t drain the water away, the fish cures in a makeshift brine, which is OK if there’s enough brine to cover the whole of the piece of fish, but in all likelihood, there won’t be. It’s better to use a container with a couple of holes in the base to let the brine escape. To do this, punch a few small holes in the bottom of a large plastic box to let the liquid escape, and catch it in an old baking tray underneath. You’re also going to need to press your fish to help speed the cure and push out the water, so find a piece of wood – any old but clean offcut will do – that fits the box snugly. Wrap the wood in clingfilm, just to keep everything clean and find something heavy to weigh it down. Chop a good-sized handful of dill very finely, and mix it with 100g of caster sugar, 75g of sea salt and 15g of freshly ground pepper. Cover the bottom of the plastic box with some of the cure, and rub more of it into the fleshy side of a 1kg fillet of salmon before putting it in the box, skin side up, and covering the top with the rest of the cure. Place the wooden board on top and weigh it down with something heavy. I used a 2.3kg barbell weight – too light to be any real use on a barbell, but heavy enough to weigh down a piece of salmon. Fit the top on the box, or cover it with more clingfilm if the lid no longer fits. Put the plastic box in the old baking tray and put the whole lot in the fridge. After a couple of days, turn the fish over and redistribute the cure. After five days, the fish should be ready. It should feel firm to the touch in the centre. Carefully wash the cure away with cold water, dry the fish and slice it as thinly as you can with a large knife. There’s a definite knack to this, and it takes practise. The gravad lax will be quite happy wrapped in clingfilm in the fridge for a couple of weeks. Serve with a dressing made from 200g of sour cream, more chopped dill, a squeeze of lemon, a tablespoon of wholegrain mustard and some salt and pepper. The rest of this sauce is excellent as a dressing for some cold new potatoes, too. I like how you used Twitter to secure some dill/herbs. 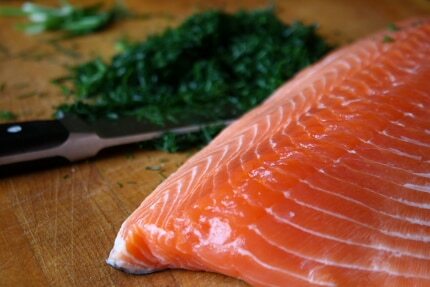 Gorgeous piece of salmon you have there – 5 days to cure, seems like such a long time to wait – but oh so worth it. Great post! I have always loved Scandinavian cuisine, in my opinion totally underrated…natural, healthy and tasty! If this Gravad Lax taste half as good as it looks then it must have been great. Love the dill story, very funny. When you are waiting for the magic to happen where do you keep this stored? In the fridge? This sounds like something I would LOVE to try to make! Yep, keep it nice and cool in the fridge. Thanks! You probably stated this already–I should drink more coffee before carelessly posting on the internet! Wow, that's beautiful. Such a great job of describing the process too. I've never cured meat or fish before but I really feel as though I could make a go of it after reading your post. Many thanks for the vivid description. Brilliant process description – the brine scenario is well done. Many Thanks! I've got some home smoked salmon over on my bit – just need a roulade or mousse now and there could be a blog Salmon Assiette in the offing. I LOVE salmon- that looks delish! My absolute favorite salmon dish is linguine with smoked salmon. It's definitely not healthy, but it tastes amazing! Loved gravad ever since I first tasted it in Sweden some years ago. It also gave me a taste for dill for general use with fish. Here in Leeds I have several asian minimarkets nearby, many with vegetable stalls outside. They all seem to sell big bunches of fresh herbs (mainly coriander, dill and flatleaf parsley) at a fraction of supermarket prices. They just need a good rinse under the cold tap. I get mine there, along with fresh okra, chillies, hands of ginger, big healthy garlic bulbs, etc. They also sell mustard seed in big pots which is mild but interesting if you grind it in pestle and mortar and mix with a dash of white wine as an alternative to the moutarde ancienne you’re using. All this is making my mouth water – I’m off to check on my sweetcure herring and open a bottle of Sancerre. Keep up the good work! Do you complain in restaurants?